Republicans consistently support issues vital to business and industry, while Democrats’ actions show lower enthusiasm for entrepreneurship, a survey of General Assembly members concluded. 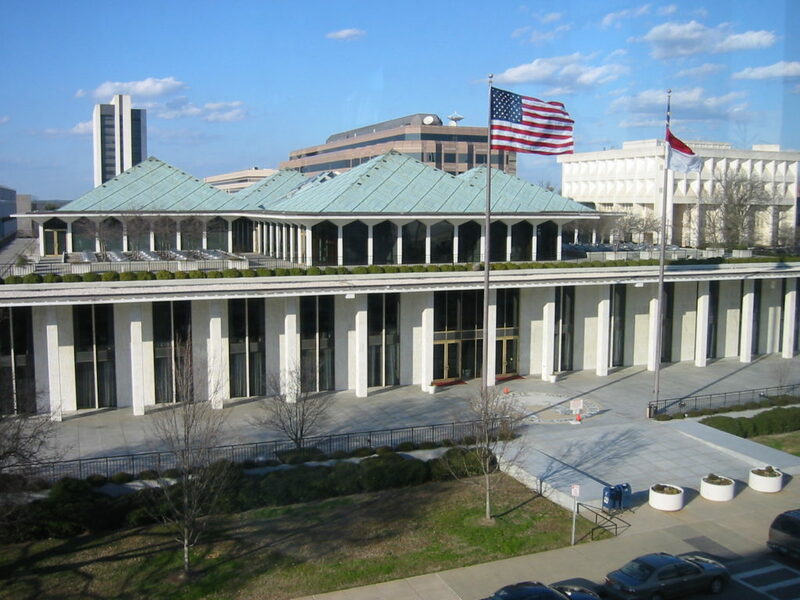 Republicans said the nonpartisan North Carolina FreeEnterprise Foundation’s 2017 Legislative Business Ratings report accurately portrays the GOP’s role in boosting the state’s economy. Democrats downplayed their low rankings. The survey examined a variety of bills as part of an objective analysis of recorded votes. A subjective analysis rated lawmakers’ personal interactions, stated support, and willingness to meet and discuss issues. The two were averaged, with 100 the top score possible. A rating of 70 or higher indicates consistent, strong support of free enterprise principles. Every House and Senate GOP member earned that designation. The survey found 77 of 120 House members were in that solid, business-friendly base — and just three of them Democrats. Of 50 senators, 36 achieved that score, but only one was a Democrat. Lawmakers scoring between 55 and 70 occasionally supported free-market principles. All 13 House members and four senators in that category were Democrats. All lawmakers earning less than 55 — 30 in the House, and 10 in the Senate — were Democrats. The five top-ranking lawmakers were: Rep. Jason Saine, R-Lincoln, (96.3); Rep. John Bell, R-Wayne, (96); Sen. Brent Jackson, R-Sampson, (95.8); Sen. Bill Rabon, R-Brunswick, (95.7); Senate Leader Phil Berger, R-Rockingham, (95.5). The five lowest-ranking members were all Democrats: Rep. Amos Quick, D-Guilford, (33.3); Rep. Verla Insko, D-Orange, (31.6); Sen. Gladys Robinson, D-Guilford, (24.2); Rep. Pricey Harrison, D-Guilford, (23.7); and Sen. Jay Chaudhuri, D-Wake, (17.2). 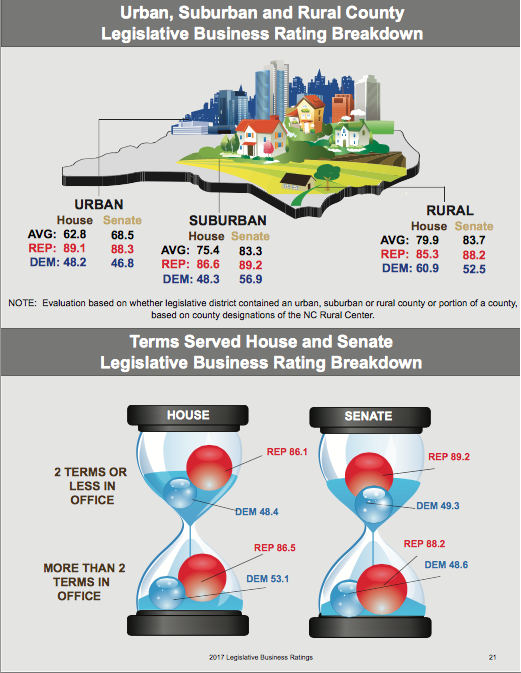 Saine attributed Republicans’ performance to a large gap in governing philosophies among the two parties, nationally and in North Carolina. For the past several years, he said, North Carolina Republicans prioritized economic growth through meaningful tax reform and cutting regulations that hindered growth. “Many members of the Democratic caucus are welded to [a] progressive philosophy that would inhibit growth and would take North Carolina back to the days of high taxes, burdensome regulations, and crippling debt,” Saine said. Saine said his experience as an employee and a small business owner provided firsthand knowledge of the importance of a business-friendly environment. He said he’s proud of sponsoring and voting for legislation to help businesses start and grow. He said the strategy is working: Unemployment dipped from 11 percent in Lincoln County when he took office in 2011 to 3.9 percent in July. Jackson said as a business owner he always takes into account how his Senate votes will affect businesses and their employees. The GOP’s survey performance shows state residents their elected officials support them, and understand the needs of the private sector, he said. “Rural North Carolina was hit hard in the last recession, and we must have the right policies in place to foster economic growth and investment by new businesses,” Jackson said. Differing political philosophies, and the fact most bills that became law were championed by the majority party, help explain the business ranking disparity, he said. Insko and Harrison denied being anti-business. “The explosive economic growth of the 20th century happened when government played a strong role in funding basic research and development that the private sector then used to produce goods and services that benefitted the general public, and boosted more people out of poverty than had ever happened previously in the history of humankind,” Insko said. “The market didn’t do that out of thin air; government played an active, important role,” she said, and the public needs them working in tandem. Harrison said her ranking might have suffered because she strongly opposed some of the legislation in the survey that included environmental and public health rollbacks. She cited Senate Bill 16 and House Bill 56 as examples of business and environmental regulatory reforms with features she supported. But she voted against the bills because they involved water quality rollbacks at a time the state is trying to determine the damage caused by release of the chemical compound Gen X into the Cape Fear River. She voted against The Farm Act of 2017, the so-called hog nuisance bill, because of the need to protect property rights of neighbors. “If that’s going to make me anti-business, I wear that as a badge of honor,” Harrison said.